Gita has been in practice for over 20 years and is an expert on vegetarian nutrition and diabetes education. In addition to discussing more about her upcoming book, Gita also shares her amazing stir-fry recipe that was featured in Cooking Light in 2010. “Blending Science with Spices” is a completely gluten free, vegetarian cookbook with options on making every recipe vegan if desired. To enter the give-away, please comment below with your favorite tip for “healthy living.” The winner will be chosen at random on Wednesday at 6PM, good luck! DK: Why did you decide to write this book? Gita: My patients tell me the fast pace of today’s “developed” world makes it hard to eat well. They say over and over again that all the knowledge in the world about nutrition does no good if it cannot be implemented easily. The purpose of this book is to show how to choose health, understand nustrition science, and easily put the information to use to make the kitchen into an “instant take-out” hub for healthy food. I also wanted to share my approach to healthful cooking which combines modern nutritional science with my traditional vegetarian Indian heritage to improve the quality of lives by supporting health with nutritious food. Color is used as a theme throughout this book to illustrate the bounty provided by nature and as a guide to healthy eating. Food color is indicative of health-enhancing phytonutrients that act as antioxidants to fight harmful chronic inflammation. Phytonutrients occur naturally, but only in plants. These phytonutrients reduce our risk of those diseases associated with chronic inflammation, including cancer, atherosclerosis and diabetes. When you get home from work at 5:30 pm and the family is tired and hungry, you want to reach for whatever is “quick and easy.” I show you how to make the kitchen into an “instant take-out” hub. Your freezer and pantry will be stocked with healthy foods, so you will have the knowledge and ability to put “Feeding Health” into action. DK: I love the idea of a “take-out hub.” Where do you get your inspiration for your recipes? Gita: My mother is the source of inspiration for healthy eating. I enjoy eating nutritious foods and I believe my creativity is best expressed in the kitchen. 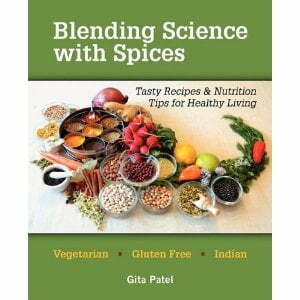 DK: Your book is titled “Blending Science with Spices,” is there one spice you find most beneficial? Gita: Herbs and spices (in use since approximately 5,000 B.C.E.) are among the richest sources of antioxidants and play a central role in Indian cooking. They can reduce salt, fat and sugar by adding flavor to foods without adding unwanted sodium and fat calories. If I had to pick just one it would be turmeric. It is anti-inflammatory, odorless and flavorless, but imparts a beautiful yellow color to the food. However, many other herbs and spices (such as cinnamon, cloves, coriander, dill, garlic, ginger, mustard seeds, turmeric, garlic and many others) have high ORAC scores. DK: Your book is completely plant-based; what advice would you give someone who is interested in trying to eat more plant-based foods, but afraid of taking the leap? Gita: They do not need to take the leap. All the recipes can be used as side dishes or entrées. About half the recipes are vegetables, then come beans and legumes and then grains. If they want to be vegetarians or vegans they can start slowly with breakfast, and then move on to including lunch and finally dinner. Or they can choose to decide on 1 day each week that may be all plant foods. Enjoy one meatless day each week. DK: Tell us more about “Blending Science with Spices: Tasty Recipes & Nutrition Tips for Healthy Living.” Where can we buy it and what is its focus? The focus is on planning, nutrition and health, taste, cooking and variations. I have woven simple recipes with adaptations and variations with evidence-based rationale for the science of nutrition to substantiate each and every recipe. The recipes and tips help to make kitchen time more fun than work, with an outcome that is divine. This practical vegetarian cookbook (with vegan options) with an index, nutrient analysis, menus and much more will transform your kitchen into an instant take-out place for healthy food. Simple recipes highlighting spices and herbs enhance vegetables, beans, and grains, while the accompanying index, glossary, and nutritional analysis of each recipe make the book accessible to even the most tentative of cooks. About half the recipes are the most nutritious part of your plate…the vegetables. I have included a nutritional analysis of each recipe’s star and supporting cast, which affords you the opportunity to take charge of your health by guiding you to make appropriate, educated culinary decisions. DK: Would you mind sharing your favorite recipe with DK followers? Gita: I was one of four finalists in Cooking Light magazine’s Healthy Cook of the Year contest in 2010. I have many favorites, however the recipe I entered for the contest is one of my favorites. It is very quick, tasty and easy to prepare. Assemble and prepare all ingredients. Add jalapeño, salt and turmeric to the corn and set it aside. Heat on medium-high heat a 2 to 3 quart skillet or pan. Add cumin seeds. When the seeds begin to change color add oil and garlic, turn heat to medium. Fry the garlic for a minute, then add corn with combined ingredients. Stir and cook covered for 2 to 3 minutes. Stir and add edamame, zucchini and red pepper. Stir and cook covered for 3 to 4 minutes. Before serving add chopped cilantro and fresh lemon juice, stirring to mix all the ingredients. Serve the vegetables over rice, quinoa or millet as part of a meal. Enjoy leftovers for lunch in a pita pocket. 1. Eliminate jalapeño if you prefer it without the heat of the pepper. Substitute cayenne pepper, fresh ground black pepper or mild paprika for the jalapeño. 2. Substitute chopped onion for garlic. 3. Substitute either basil or parsley for cilantro. 4. The recipe calls for 6 ½ cups of vegetables, so you can substitute a variety of vegetable combinations. 5. Substitute 1-cup sprouts for 1-cup zucchini. 6. Substitute canned beans for edamame. DK: Tell us a little about your services offered and how to get in touch with you for more information. Gita: I partner with individuals and organizations that want the science of nutrition translated into the art of healthy vegetarian cooking. I am a registered dietitian, certified diabetes educator, and certified LEAP (Lifestyle Eating and Performance) therapist specializing in diabetes, women’s health, heart disease, vegetarian nutrition, healthy aging, migraines, IBS, IBD, Celiac disease, gastrointestinal problems with food allergies, food sensitivities and food intolerances, and multiple sclerosis. Thank you Gita for the interview, don’t forget to comment below to enter to win! Yes! I often say the exact same thing when asked about my advice for thanksgiving, christmas, birthdays, ect. No one was harmed by feasting on one meal! Look at history and the 5-6 days planned each year as “feasts.” The problem is when these overindulgences become daily events. Enjoying your food is so important! One of my favorite sayings is “More doesn’t taste any better it is just more” I try to watch my portions and I love the new food plate diagram with more veggies and fruit and smaller portion on protien. Great interview and am looking forward to reading more about the use of spices in everyday cooking. Spices make low-fat eating a piece of cake! Flavor is so important and spices are so good for you! I love your quote, thanks! I love how this cookbook doesn’t sacrifice good food in order to be healthier. You can still eat really well! Isn’t is delicious? Thanks for commenting! I completely agree. I posted a week or so ago of getting rid of the “superfood” mentality. i see so many patients who are overwhelmed with the amount of information out there. Good nutrition shouldn’t be that hard. My simple suggestions are: reduce your consumption of things that can sit in your pantry for months (excluding whole grains like brown rice, quinoa, millet, ect). and increase the amount of fruits, vegetables. You get SO much nutrition from vegetables, it’s unbelievable. Even small changes can produce big results. Thank you so much for posting this interview and book info. I am “newer” vegan and a diabetic. I will definitely be purchasing this book. Love the use of multiple spices. Eat to Live…Don’t live to eat. Substituting traditional Indian spices for salt can help lower blood pressure and prevent heart disease…AND will NOT compromise flavor!! Thanks for sharing this book with us DK! LOVE it 🙂 great interview and tons of good advice. thanks for sharing! hope I win the book!!!! !